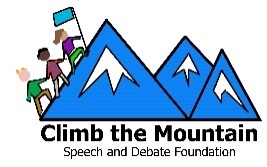 Climb the Mountain provides support for coaches, students, and judges to build a bigger and even better speech and debate community. Note: The adobe reader file is large and may take time to appear. Want your school’s information edited? Email Jim Hanson at jim@climbthemountain.us and tell him what changes to make.